This past Wednesday and Thursday, the Dakota Access Pipeline protest camps were cleared by more than 200 police officers in riot gear as part of an emergency evacuation order signed by North Dakota governor Doug Burgum. Many of the water protectors cleared out peacefully, and some set fire to their camps as a ceremonial act of defiance to destroy it themselves before law enforcement could. 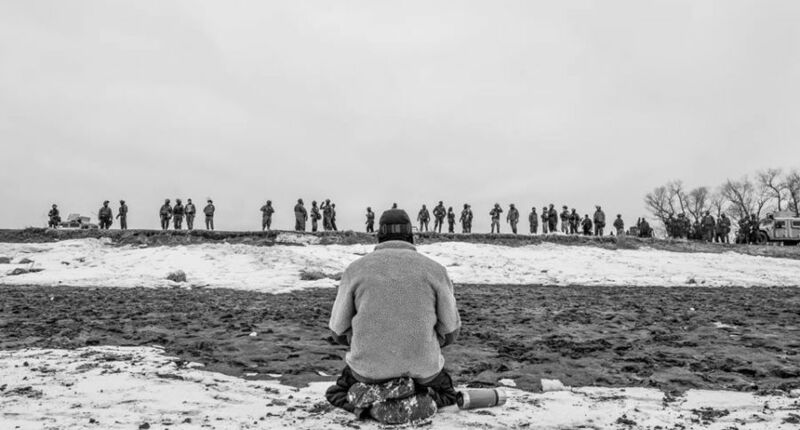 Over the those two days, 46 water protectors who refused to comply with the evacuation were arrested, including a group of military veterans, reporting journalists, and even an Oglala grandmother named Regina Brave. Present at the occupation of Wounded Knee in 1973, Brave was also a vocal opponent to the Keystone XL pipeline in recent years. Even when water protectors are leaving peacefully to move on to larger movements, North Dakota law enforcement proved once again that they cannot do their jobs without abusing their power. Arriving with armored vehicles, snipers and AR-15s is beyond extreme, especially against those whose only “crime” is just refusing to move or live streaming the eviction to Facebook, the latter being the case for Eric Poemz as he was chased by police in his live stream and can be heard saying his hip may have broken as he was forced to the ground. This amount of law enforcement is unnecessary, especially when they go so far as to violate First Amendment rights and try to silence anyone who tries to publicize the truth. After the camps were cleared, Energy Transfer Partners announced that they finished drilling under Lake Oahe and will begin laying down pipe. According to their attorney, William Shcerman, DAPL’s construction could be finished and begin flowing oil in less than two weeks. Things are not getting any better at the White House as they try to pass off their blatant lies — or what they call alternative facts — as truth. White House Press Secretary and Communications Director, Sean Spicer, claimed in a recent press briefing that President Donald Trump “has been in contact with all parties involved” with DAPL. Shortly afterwards, Standing Rock Sioux Chairman, Dave Archambault II, posted a response on Facebook that that was ‘absolutely false.” The tribe only finally received a meeting the day after the easement to drill under Lake Oahe was issued, to which Archambault cancelled it and filed a lawsuit for the illegal expediting and suspending of the environmental impact study. Spicer’s briefing also contradicts Trump’s claims almost two weeks ago that he didn’t find DAPL controversial and hasn’t received a single phone call. Of course, he hasn’t been taking any phone calls given that the comments line is down with only an automated message with instructions to submit your comment on the White House’s website. At this point, does the Trump administration think they’re that clever to make anyone believe anything they say? To top all of this off, ABC News revealed that two days before Trump approved of the easement, the US Department of Interior withdrew a 35-page legal analysis — written by the department’s top lawyer Hilary Tompkins — of the environmental risks and treaty rights violations of DAPL with more than enough justification to deny further construction. So not only is the Trump administration lying through their teeth about their involvement and active listening in this controversy, but they are also willing to throw away anything criticizing their biased personal interests as an attempt to avoid accountability, no matter how irrefutable it is. The camps may be shut down, but the fight against DAPL is far from over.Protests continue nationwide urging major banks to divest from DAPL, and a Native Nations March is planned for March 10th in Washington DC and nationwide. Chase Iron Eyes with LPLP plans to rally support for the new lawsuits filed by the Standing Rock Sioux and Cheyenne River Sioux tribes. Contact your representatives to support the fight against the Black Snake. Donate as the water protectors fight moves to D.C.